Burglary Attempt – On December 16, 2015 at 4:01pm, Patrolman Keith Meissner was dispatched to a residence on the 200 block of Tiller Avenue for a report of an attempted burglary. Upon the officers arrival, the victim advised that a window pane on the rear door had been broken by an unknown actor(s). There was no entry made to residence which was unoccupied at the time of the incident. Det. Sergeant Altman has been assigned to follow up on the incident. Criminal Mischief – On December 18, 2015 at 11:12am, Patrolman Sean Langan responded to a residence on the 400 block of Surf Avenue for a report of criminal mischief. The resident reported that a windshield wiper on a 2007 Nissan vehicle was damaged. The incident occurred sometime between 11:00am on Dec. 16th and 9:00am on Dec. 17th . Burglary – On December 18, 2015 at 12:45pm, Patrolman Justin Apel responded to a vacant residence on the 100 block of Halliard Avenue for a report of a suspicious male coming from the residence. The officer observed a broken basement window and upon checking further found the residence to be unoccupied at that time. On December 23 at 4:45pm Patrolman Meissner and Sgt. Mussari were again dispatched to the vacant residence at which time they located a male subject in the residence. 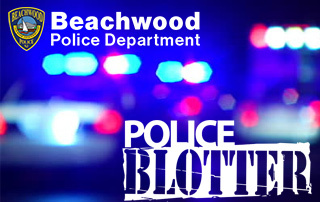 As a result of their investigation, the male subject identified as Jason Chewning Sr., 42 of Beachwood was arrested and charged with burglary and criminal mischief. Theft – On December 18, 2015 at 7:04pm, Officer Gina Bruno responded to a residence on the 1500 block of Windward Avenue for a theft report. The resident advised that someone stole a holiday laser light projector which was located on the front lawn area of the residence. The item was valued at $80.00. Theft – On December 19, 2015 at 12:08pm, Patrolman Justin Apel was dispatched to a residence on the 100 block of Pacific Avenue for a theft report. Upon the officers arrival the resident advised that two gift cards were taken from the residence and also showed the officer a broken basement window believed to be used to enter the residence. Further investigation by Det. Sergeant Altman generated a family member as a possible suspect and charges are pending in the case. Burglary – On December 22, 2015 at 1:24pm, Patrolman Sean Langan responded to a residence on the 200 block of Beach Avenue for a theft report. Upon the officers arrival, the resident advised that someone broke a glass pane on the front door and gained access to the residence, sometime between 9:00am and 1:24pm on Dec. 22nd . The resident reported that the suspect stole $200.00 from the residence which was unoccupied at the time. Det. Sergeant Altman was assigned to follow up. Theft – On December 23, 2015 at 1:48 pm, Patrolman Sean Langan was dispatched to a residence on the 900 block of Anchor Avenue for a theft report. The victim advised that they believe a home health aid may have stolen $50.00 in cash and a wallet from the residence. The items went missing sometime on or about November 14, 2015. Detective Adam Griesemer was assigned to follow up on the case. Theft – On December 25, 2015 at 12:30am, Patrolman Andrew Altman responded to a residence on the 700 block of Leeward Avenue for a theft report. The victim advised the jewelry, valued at $800.00, was taken from the residence by a former friend. During a follow up investigation conducted by Detective Adam Griesemer, a sales transaction was located identifying the suspect selling the victims jewelry. As a result of the follow up investigation, Patrick McGough, 25 of Brick, was charged with theft. He was lodged in the Ocean County Jail on $15,000.00 bail. Criminal Mischief – On December 28, 2015 at 11:23am, Patrolman Apel responded to a residence on the 1100 block of Berkeley Avenue for a report of a mailbox that was damaged.